Around the fringe of Europe lies a green ring of countries which have followed different pathways into modernity from the industrial core of the continent and have, until recently, been characterized by a strong agrarian presence in their politics, economy and culture. This book brings together case studies from both the post-socialist countries and EU member states which make up the green ring to compare experiences of rural and agricultural groups. It provides a fascinating opportunity to identify similarities and contrasts in the ways in which these countries have managed their rural areas when faced with the challenges set by industrialization, political integration and globalization. The book focuses on agrarian transformation as de- (and sometimes re-) peasantization - referring to the changing economic, social, cultural and political positions of farmers and food production workers. It also problematizes the standard rural models and opens up discussion of the problems these models pose for the farmers of the green ring countries. Contents: Central and Eastern European Countries in the Green Ring: De-peasantization or re-peasantization? changing rural social structures in Poland after World War II, Krzystof Gorlach and Pawel Starosta; De-peasantization of Hungarian rurality, Imre KovÃ¡ch; The changing role of agriculture in the Czech countryside, VÃªra MajerovÃ¡; Rural change in Bulgarian transitions, Bob Begg and Mieke Meurs; Soviet patrimonialism and peasant resistance during the transition - the case of Estonia, Ilkka Alanen; Rural transition problems and post-socialist peasantization in the Russian forest periphery, Eira Varis; Post-traditional or post-modern rurality? cases from East Germany and Russia, Karl Bruckmeier and Marina Olegowna Koptina. Mediterranean Countries in the Green Ring: The de-agriculturalization of the Greek countryside: the changing characteristics of an ongoing socio-economic transformation, Charalambos Kasimis and Apostolos G. Papadopoulos; Shifting rurality: the Spanish countryside after de-peasantization and de-agrarianistion, JesÃºs Oliva and Luis A. Camarero; Portugal: the emergence of the rural question, Isabel Rodrigo and Manuel Belo Moreira; Reconstructing rurality in Mediterranean Italy, Maria Fonte. The Green Ring in the North of Europe: Peasantization and beyond in Finland and Scandinavia, Leo Granberg and Matti Peltonen; Creating and re-creating modernity: peasantization and de-peasantization in Ireland, Hilary Tovey; Societal paradigms and rural development - a theoretical framework for comparative studies, Ivar Jonsson. 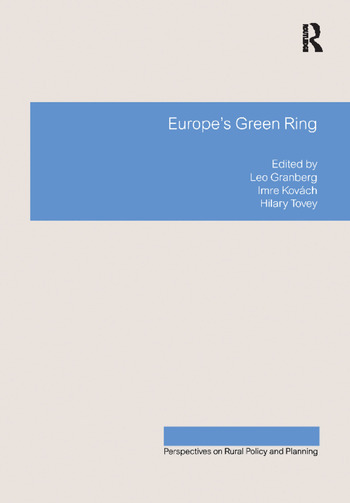 The Future of Peasants in Europe’s Green Ring: Afterword, Leo Granberg, Imre KovÃ¡ch and Hilary Tovey.